12 classic Season's Greeting and Christmas Cards drawn from the stylish wintery wonderland of the Art Deco era, 2 each of 6 designs with 12 envelopes. 12 classic Season's Greeting and Christmas Cards drawn from the stylish wintery wonderland of the Art Deco era, 2 each of 6 designs with 12 envelopes. 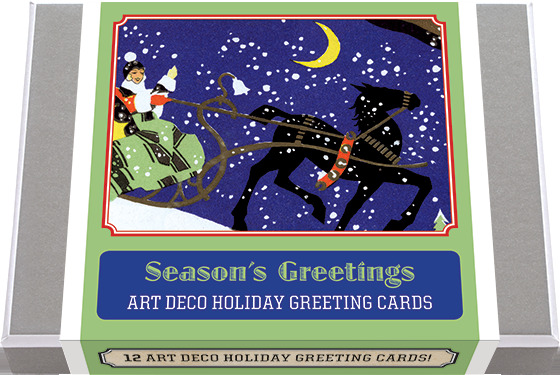 These greeting cards, depict sleighs being pulled, visits of Christmas cheer, holly and wreaths, all in Art Deco style and color. These cards will make a perfect compliment to a stylish Christmas correspondence. Made in America with high quality paper, envelopes and packaged in a deluxe, keepsake box. All cards are blank inside.